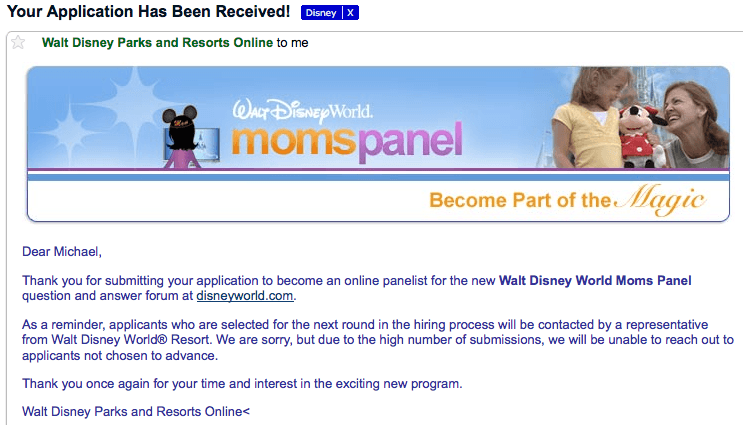 Just a reminder if you haven’t filled in your application yet for the 2011 Walt Disney World Moms Panel, tomorrow today at 11:30 11:59 PM is your deadline! I suggest that you do it tonight or tomorrow morning because the site may be packed if you wait too long. For more information, check out my previous blog post. Well, I’ve done it — I have officially applied to become a “Mom“! I have read a lot about the Walt Disney World Moms Panel, and everyone that is on the panel felt like they didn’t do well on some part of the process. Well, I feel the same way! However, today was not so much about getting onto the Moms Panel — I won’t know until November 8th if I even make it to the next round — it was more about reliving some classic Disney moments. I would be incredibly honored and humbled if I were to be chosen for the Walt Disney World Moms Panel — but for me, the honor really lies in being able to apply in the first place. Walt Disney has, as always, really done a lot to continue the Magic for those even when they aren’t at any of the parks. By opening up a piece of Disney Magic to us, the fans, even when we aren’t at a park just continues our drive towards the next time that we are able to enjoy Disney in person. So, for now, I’ll keep up the hope of reaching the second round, and know that if I don’t get in this year, there is always next year!